New 3 Month Group Coaching Opportunity: Beginning February 11th - see www.LeslieVernick.com/three-month-group-coaching-program/ for details or contact assistant@leslievernick.com for more info. I was speaking at a large women’s event in Texas. During the break, a woman asked if she could speak with me. “Give me a few examples of what you mean,” I asked, wanting to see where she was going. By now tears were streaming down her face and it was obvious she was distressed exposing her very human character flaws. This woman’s problem wasn’t excessive self-love and desire for admiration (which narcissists never notice about themselves anyway), but rather destructive shame and self-hatred. In our brief conversation I learned that she lived by an internal script that dictated that she should be better than she was. She failed to live up to her idealized image of herself as a selfless person and after numerous attempts at change, she felt hopeless. People who are perfectionists may not demand perfection in every area of their lives and often have a hard time admitting that they think they should be perfect, but deep down that’s what they crave. And when they fail to live up to their own idealized standards, they grieve deeply. Their internal shame, self-hatred, and self-reproach can be lethal. These individuals rarely feel happy because although they might achieve a moment of perfection, it’s entirely unsustainable. Eventually they mess up, can’t do something, aren’t all-knowing, fail, make a mistake, or put their own needs or desires ahead of someone else’s. This woman was not my client and we weren’t in a session, but I had something to offer her in that moment that provided a real solution to her pain. I had the privilege to show this hurting woman a glimpse of what God is like and surprise her by the good news of the gospel of Christ. He is the answer to this woman’s pain because he gives her what she cannot give herself. Real forgiveness, radical acceptance, grace, peace, hope, love, and true truth. What I said to that woman at the conference was something similar to what Jesus said to the rich young ruler who asked if he was good enough to inherit eternal life. (See Luke 18:18-27 for the story). Later on in the day she caught my eye and her countenance was transformed. She believed God and found hope. Question: I am being told that I am being controlling, being the head of the house which leads to witch craft, Jezebel, and antichrist etc. I’m told all I need to do is release the control back to my husband. Otherwise I will reap what I sow. After money being spent on things that did not need to be spent on and pay checks being spent before I had deposited them in the bank I started to put my pay from work in to a separate account as we have two children who need to be looked after. My husband is not working. Currently he is being required to stay at another address because of destructive behavior. He believes it is my responsibility to fix up the court breech and if I had just done what he had said at the time none of this would have happened. He apologizes and I always forgive. If I don't release the control the person who he is staying with says he will probably move away. We have a 10 & 12 year old and for him to even contemplate leaving I find difficult to understand or is this just further manipulation? He is due to appear in a few court matters between now and March. Have you any advice for my situation? Answer: First of all it’s interesting that you are warned that you are out of line by taking control of your own finances and that if you continue this behavior you will sow what you reap – implying that God will judge you harshly. But your husband can sow repeated abuse, financial instability and insecurity and he’s supposed to not sow what he reaps? How crazy is that? Take look at the upcoming events to watch for from Leslie. 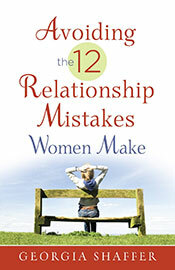 Avoiding the 12 Relationship Mistakes Women Make by Georgia Shaffer. Plus see the winner of the previous give away! Licensed psychologist and Certified Life Coach, Georgia Shaffer reveals 12 ways you could be undermining your chances of enjoying fulfilling relationships. Drawing on insights from Scripture and her own case studies, Georgia empowers you to identify blind spots in your own life, minimize their destructive impact, and turn damaging patterns into productive ones. You will also discover how to…develop your unrefined strengths; acknowledge the power of brief feelings of fear, bitterness, and other toxic emotions; face the pain of reality with courage; recognize the impact of your past; and take responsibility for your poor choices and learn from them. With compassion, candor, and grace, Shaffer provides you the encouragement and practical tools you need to make significant and lasting changes in your life. To win this book, please email your name to assistant@leslievernick.com with "Book Give Away" in the subject line by midnight Sunday, February 16th. The winners of The Long Awakening: A memoir by Lindsey O’Connor are: Linda (North Wales, PA) and Amy. "To attend a seminar led by Leslie Vernick is to be embraced by her thoughtful and compassionate heart, yet challenged by her practical insights, self-tests and tips. We left with a deeper understanding of who we were, where we had been stuck, and how to move forward in our walk with Christ."